Try Continuous Ink System with your Brother MFC 845CW and make 30 times more quality prints for the same money! Pay only 0.04 USD for A-4 full color print! WhatвЂ™s a Continous ink system brother mfc-845cw? The CISS for Brother MFC-845CW, as well as similar models CISS for Brother MFC-3220C and CISS for Brother MFC-3420C, is applied to make inkjet printing process cheaper. This device sufficiently reduces expenditures for inkjet printing. CIS brother mfc-845cw can be used successfully in offices, at home, in advertising agencies and printing centers. This technique is quite efficient, thatвЂ™s why it is very popular. Printing with CISS is extremely profitable, because it has the same quality, while its cost is considerably lower! 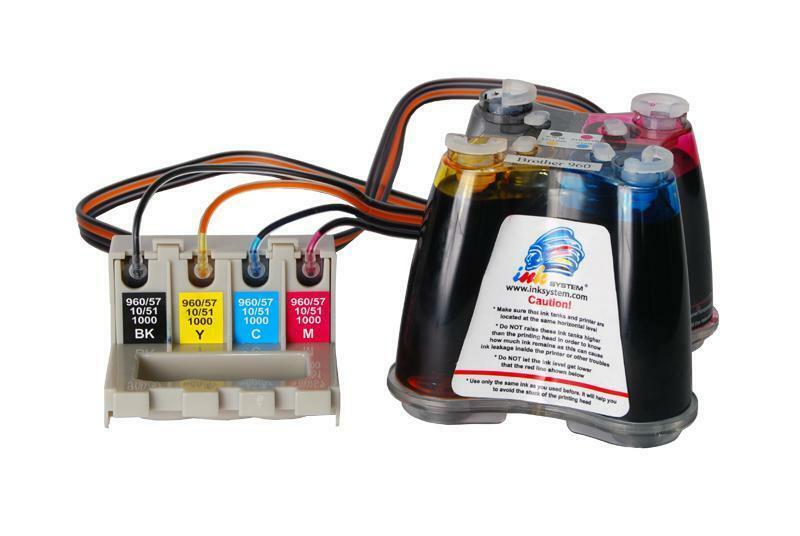 A bulk ink system for brother mfc-845cw can be installed onto various multifunction devices, such as printer-scanner-copiers, plotters or inkjet printers. With its help every following print will save you more money. If you decide to equip your printing device with the MFC-845CW CISS instead of using original consumables, you will be able to print 30 times as cheap! When is Such System of Ink Supply Effective? The non-stop ink supply systems Brother MFC-845CW CISS are designed for inkjet printers with fixed print heads (opposite to those, there are printers without their own print heads. In this case print head is supplied as a part of a replaceable ink cartridge). The main difference is the head duty cycle length. Continuous ink supply systems can be used with all Brother inkjet printers, but this very system model together with a Brother printer has the following advantages: it helps to decrease printing expenses by more than 50 times as compared with original cartridges and by 30 times as compared with non-original ones. If such ciss mfc-845cw is used at home, it will save a lot of money and time for printing photos and any other color products. When operating in office, the non-stop ink supply proves its excellent economy while printing ordinary office documents as well. Now the ciss ink system brother mfc-845cw has made inkjet printing cheaper than laser printing. The most of inkjet printers and MFD models can use continuous ink supply system. Today the list of such equipment comprises more than 2000 models of printers, MFDs and plotters manufactured by Brother and other companies, and itвЂ™s important that this list is all time growing. A long-term professional experience of operating non-stop ink supply systems shows that, due to their design, Brother printers and MFDs can cooperate with the CISS for MFC-845CW better than other devices, because they use piezoelectric print heads. Both in office and at home, the CISS for Brother MFC-845CW is irreplaceable for printing high quality photos and multi-page documents, as well as for printing on laser discs, envelopes, plastic articles and even on cloth.